DALLAS — “It’s like realizing there’s a skunk under your house,” is how Texas humorist Jim Hightower explained discovering the American Legislative Exchange Council to 500 protesters here July 30. They were here to expose the right-wing lobbying organization which was holding its annual national conference. The “stink tank,” as it has been referred to in trade union circles, is responsible for initiating and financing anti-union, privatization, racist, and anti-democratic state legislation throughout the nation. 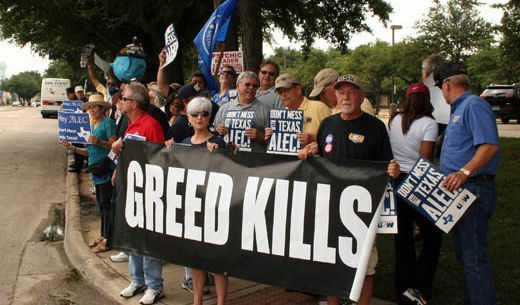 ALEC generates boiler plate legislation to weaken unions, to facilitate private takeover of public institutions, to curb the right to vote and laws that facilitate racist violence against mionrities, the best example of which are the “stand your ground” laws passed in many states. Dallas activists had been planning for the ALEC conference here for months, beginning as soon as they hearsd the group would hold its national convention at the posh Anatole Hotel here. The Dallas AFL-CIO led the coalition. Church, civil rights, retiree, and community organizations pitched in. Some of the participants opined that it was Dallas’ first major labor-led coalition protest in half a century! The fact that right wingers are attempting to privatize the entire Dallas Independent School District added special heat to the anger against ALEC, because ALEC champions the corporate drive to privatize all forms of economic activity. The protest began with a short organizing meeting at the Community Brewery, just about a mile from the Anatole Hotel. Participants took shuttle buses to the Anatole where they covered both sides of the street. Steelworkers had brought an inflatable pink pig that was at least 25 feet tall. 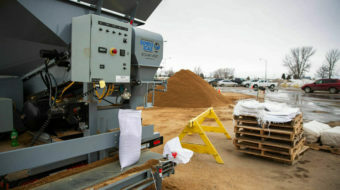 Then demonstrators returned to the brewery building and heard experts from all over the country explain exactly how ALEC carries out its sordid business. The best source of information, they agreed, is www.alecexposed.org.